Join the discussion on our forums! Come discuss Chief Inspector over in our dedicated Chief Inspector discussion topic. Battlecry: Destroy all enemy Secrets. Empty your pockets, I know you’ve got a Wandering Monster in there! April 9th, it'll maybe finally be your time to shine? Great anti secret card :) vs mage's or hunter's maybe paladins. i'm getting some Streetwise Investigator vibes off this card. Does it destroy secrets that your opponent currently has over his portrait or does it destroy ALL secrets in his deck? It works like Eater of Secrets and Kezan Mystic. It only destroys secrets in play, or over your opponents portrait. Decent stats, and while a lot of secrets are rotating out of standard this will still be pretty useful. Is it better than Eater of Secrets? Sometimes it is, sometimes it is not. Some players may prefer a cheaper secret removal for more chances to play it while others may like a well stated reliable body. Eater of Secrets may get replaced by this tech card in both formats due to its more reliable stat line. 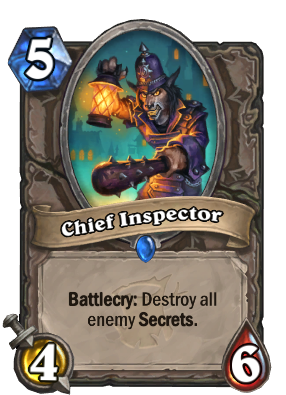 Chief Inspector is even a decent pick for Arena. This is a lot better than Eater Of Secrets. Dead dropping vs an opponent that has no secrets you still have good body stats. Big improvement. Thank god, after losing Eater of Secrets we still have a defence in standard. it's also got decent stats so it's not a dead card if you're versing non secret classes. I have a doubt, this card says "destroy all enemy secrets", but do you mean those who are on the battlefield? Do you also have the ones you can hold in your hand and in the deck? It typically has to have specified text to refer to places other than the battlefield, without that it's assumed to just be on the battlefield. Same wording as Eater of Secrets which is only secrets in play, so I'm about 100% sure it's only secrets on the battlefield. It's quite simple: before they are secrets, they are spells. Until you play them, they simply count as spells, after you played them, they turn into secrets. The card is decent, but still not that great. If secrets become an issue, then yeah this card will see play, but I'd rather just play Eater of Secrets in wild or Flare in standard just because they cost less. Expensive tech cards are only useful if they provide a strong effect, like with running Gluttonous Ooze over Acidic Swamp Ooze. Sure this card is okay in a non-secret match up, but if you face a lot of non-secret decks, why even bother running secret tech. I'm glad they printed another anti-secret card, but I just feel it's too pricy to see play outside of standard until we see another secret tech card printed that is more efficient. Edit: Also, with Secret mage losing a lot of its power in the expansion, Blizzard is going to have to make some pretty strong secrets in order for this card to see play.